“Humbling” was the prevalent adjective used by the scientific teams and the media to describe the principal finding – that the human genome contains not the anticipated 100,000 - 140,000 genes (the stretches of DNA that direct the production of amino-acids and proteins) but only some 30,000+ -- little more than double the 13,601 genes of a fruit fly and barely fifty percent more than the roundworm’s 19,098. What a comedown from the pinnacle of the genomic Tree of Life! The human genome is made up of about three billion neucleotides (the “letters” A-C-G-T which stand for the initials of the four nucleic acids that spell out all life on Earth); of them, just a little more than one percent are grouped into functioning genes (each gene consists of thousands of "letters"). The difference between one individual person and another amounts to about one “letter” in a thousand in the DNA “alphabet.” The difference between Man and Chimpanzee is less than one percent as genes go; and one percent of 30,000 genes is 300. An analysis of the functions of these genes through the proteins that they spell out, conducted by the Public Consortium team and published in the journal Nature, shows that they include not only proteins involved in important physiological but also psychiatric functions. Moreover, they are responsible for important neurological enzymes that stem only from the mitochondrial portion of the DNA – the so-called “Eve” DNA that humankind inherited only through the mother-line, all the way back to a single “Eve.” That finding alone raises doubt regarding that the "bacterial insertion" explanation. How sure are the scientists that such important and complex genes, such an immense human advantage, was obtained by us --“rather recently”-- through the courtesy of infecting bacteria? 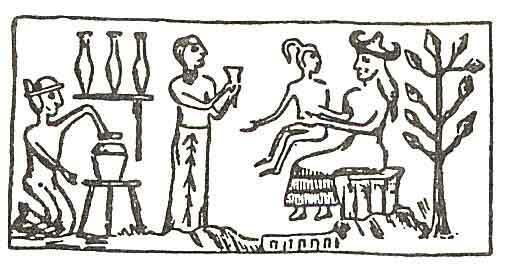 What he had in mind was to upgrade genetically the existing hominids, who were already on Earth through Evolution, by adding some of the genes of the more advanced Anunnaki. 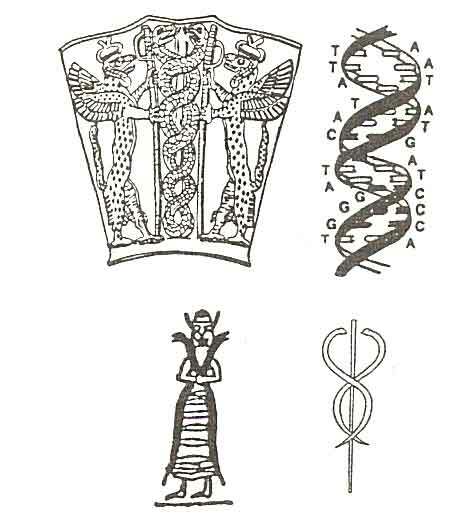 That the Anunnaki, who could already travel in space 450,000 years ago, possessed the genomic science (whose threshold we have now reached) is clear not only from the actual texts but also from numerous depictions in which the double-helix of the DNA is rendered as Entwined Serpents (a symbol still used for medicine and healing) -- see illustration ‘A’ below.